Day 23 – What is your favorite part of the day and why? My favorite part of the day is the early morning – specifically five to seven in the morning. Even though some days all I want to do is lay in bed, the days I don’t I’m very thankful. When the weather is nice, it’s my favorite time to walk or run around the city, because it’s so quiet and no one is around. Otherwise, when I go to the Y I always feel like I’m starting my day off right. Day 20 – Write about the best or worst date you’ve ever been on. I’d say one of the worst dates I’ve ever been on was a couple years ago. We went on this long motorcycle ride, which was fun, aside from the fact that it was incredibly hot that day. The 200 mile trip involved lots of stops, which of course meant that everyone was drinking, including the person driving me. There was nothing I could do about it because I don’t know how to drive a bike, so I was stuck. Once we got back home, we went to someone else’s house, for more drinking (on his part). When it was finally time to take me home, he was turning back to talk to me and we drifted onto the shoulder and almost ran into a mailbox. I nearly had a heart attack. Day 21 – What are your thoughts about body image in the media. I think what’s happening in the media related to women’s bodies is horrible. Photoshop creates so many unrealistic expectations and puts out images that aren’t even real. I could go on and on about this issue, but I won’t. I’ll just say it’s sad and frustrating and I wish more could be done to make changes in the media. Day 22 – What are your 3 biggest pet peeves? Being late. Or waiting for people who are late. People who are self centered and only care about themselves. Bad grammar/spelling – especially when it’s from professional sources. Day 19 – Write about something or someone that you really care about. There were many different places I considered going with this post – there are so many people and things I care about. My first thought was to pick a thing, an idea, or a cause that I really care about, so I could avoid being too overly personal. Or I thought about choosing a close friend, family member, or my niece or nephew because they’ve all taught me so much. But, I’ve decided to just say screw it and be personal and mushy and all of that and write about my man. When we first met, I had no idea it would turn into any of this. Whenever I’d see him out, it made me happy that I was able to make him smile by throwing some T-Swift on the jukebox before we’d even acknowledged the other was there. When we started hanging out more, it sort of freaked me out because it was like we were the same person. We had so many similar interests and ended up dressing basically the exact same way more than was normal. It was more than that though, I just felt good being around him. I really liked that he challenged me and wasn’t afraid to disagree with me. I’d had so many other relationships where it was like someone just agreed with whatever and was scared to say something that hurt my feelings. Of course I don’t like getting my feelings hurt, and there are times when it’s nice to just hear, “oh thank you, this is great” rather than the opposite, but it is nice to feel challenged after not having that basically ever. For the first time, probably ever, I felt like someone was pushing and helping me become better. He was the first person I ever allowed myself to spend that much time with. Normally if I’d see someone one day, I would get super annoyed when they wanted to hang out again 3 days later. But with him, I liked seeing each other every day or almost every day. It felt good to be together but I never felt like I needed to keep him entertained. It was easy. I like that we can be together now and be in the same room but each doing our own things sometimes. I liked that everything felt so equal for once. Like we were at equivalent points in our lives. I like that I can wear sweatpants basically all the time and not feel like a slob, cause he’s wearing sweats too. I like that we can joke with each other. I like that we both like hawaiian pizza. I like that I can trust him to drive my car. I like that we have similar tastes in music. I like listening to him sing. I like making him cookies and how he can’t eat cookies without milk. And so many other things. He gives me so many things I’ve never felt before, and for that I am incredibly grateful. Of course it’s not always rainbows and butterflies, but that’s ok. I’ve never been happier than I am at this point in my life, and I know he has a lot to do with it. Last week I wrote a post about Stitch Fix, as I was waiting for my first delivery! It came on Thursday last week, and I was so excited I took a lunch break and ran to the post office to pick it up, and ended up opening it at work since the other girls were excited to see what came too. Unfortunately, I wasn’t at my house at all before I needed to send things back (within 3 days), so I wasn’t able to get pictures of all the items. I did, however, get a picture of the items I decided to keep. Overall, I was actually very happy with the first box. A lot of the reviews I read prior to signing up, and while I obsessively waited for the box to come, indicated that many people weren’t very happy with the first one. I really enjoyed it. I was sent a metal necklace that I definitely would not have considered buying if I just saw it at the store, but liked it once I tried it on. I ended up sending it back because it was $38, which is a little pricey for me since I normally don’t wear very much jewelry. I was also sent a navy flowered sheer blouse. At first I wasn’t digging the design, but after a few minutes it grew on me. I decided to send it back because it was just a little too small where it hit my hips. Unless I want to take a saw to my hip (a co-worker’s suggestion), there’s not much I can do to make it fit better, and a bigger size would have been too large, so I decided to just return it. I also returned a green chevron print maxi dress. It fit really well, and I loved the green color, but it was just a little too short, and I’m just not a big fan of maxi dresses overall. 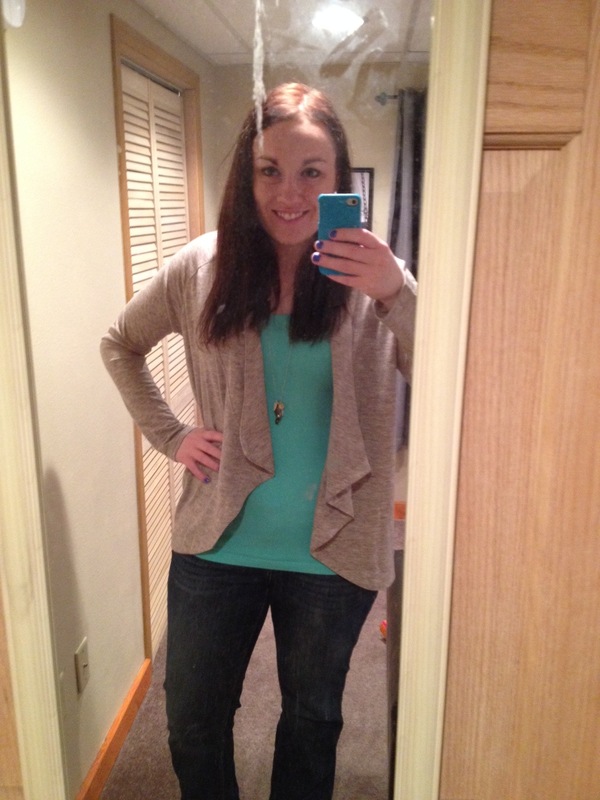 The jeans and the cardigan came from Stitch Fix. I love the oatmeal color of the cardigan, and the waterfall detail on the front. I did later notice it’s dry clean only, which is kind of a drag because I’m lazy and also don’t know of anywhere in this town that does dry cleaning. Oh well. The jeans are phenomenal. They are more expensive than I would ever spend on jeans, but they fit really well and look great. Unfortunately my mirror selfie abilities aren’t that great yet, so you can’t see the rest of the jeans, but they’re bootcut and look really good. They do stretch a little so I’m going to have to wear them right out of the dryer, but otherwise I’m very happy with them. I couldn’t wait to go online and checkout, mostly because I was so excited to schedule my next fix! Since the website is getting so popular, it won’t arrive until May 14th, which is going to feel like FOREVER, but I think I’ll manage. I also decided to sign up for monthly fixes, just so I don’t have to wait so long. I love sandwiches, pasta. and breakfast food. I could probably survive on these 3 food items if I needed to. I have never been this excited about my future. It feel so good to finally feel like School Counseling is the right career choice for me. I have also never felt this good physically. I feel strong and healthy, for the most part. I still get sick more often than most people, but for me it’s a drastic change. I get really disappointed when people don’t follow through with what they say they’re going to do. Along those same lines, I sometimes second guess the things people say. If you want me to believe you like/love/respect/appreciate/admire/whatever me, show me, don’t just tell me. Somehow in the last few months, I’ve turned into an incredibly emotional person. I don’t know what’s going on. It frustrates me, but at the same time I’m ok with it because at least it shows I care. I used to keep everything in, and that definitely wasn’t healthy for me, or productive for those around me. I sometimes feel bad that I’m losing the “fun” part of myself. Most of the time, I’d rather stay at home in sweatpants on a Friday night than go out, but maybe it’s just because my definition of fun is changing. Or I’m just getting old. Day 16 – What’s one thing you’ve never done but most people have. I’ve never eaten a full Big Mac. Apparently this is weird. I’ve had a few bites here and there from other people, and I do like them, but I’ve never even attempted to eat my own. I just don’t think I could do it. And the whole “three parts of a bun” thing scares me, because I have a small mouth (insert perverted comment here) so I’m not even convinced I could eat it without taking one piece out or using a fork.